Most people are familiar with stained glass but aren’t aware that you can do it at home. This is a craft that you can get into on your own with beautiful results, as long as you have the right tools. A soldering iron is the most important piece of equipment for creating stained glass projects. This article will help you figure out the best option for your workshop. Once you discover the possibilities that become available to you after you pick this tool up, you may wonder why you waited so long. Stained glass can be used to make windows and lampshades, along with clocks, picture frames, boxes, cabinet doors for your kitchen, and much more. Imagine the gift ideas you can come up with. Of all the items in a typical stained glass kit, the soldering iron is usually one of the most expensive. But it’s worth the cost. Imagine purchasing an iron just for the cheap price, only to find out later that it doesn’t even work right. This could be disappointing enough to make you want to quit soldering forever! 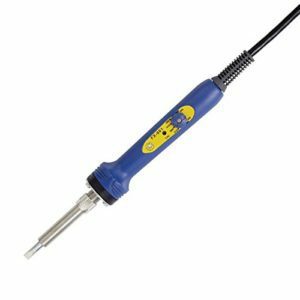 So how are you to know which type of soldering iron to pick for your stained glass projects? Your selection should come with a heat-resistant handle, feel comfortable in your hand, and have a comfortable weight for long hours soldering. It should warm up fast and maintain a consistent temperature, even over hours of use. Safety is also worth considering, of course, and your soldering tool should be compatible with various materials.